Our spacious family studio apartment can accommodate 5 people and has an ocean view. Plumería is a luxury studio apartment, located on the third floor with ocean views. Enjoy your vacation in style with this stunning suite full of personality and rich colors. The suite has a front patio at the entrance, ocean view from the large, fully equipped kitchen and bar with stools, decorated in a rich green tile and hand-crafted wood. From the kitchen, the room opens up into the living area with a pull-out sofa bed. The sundeck has a parasol, table, chairs, and lounge chairs. In the sleeping area are 1 queen bed, 1 full bed and ample storage space. Large curtains (hand-spun cotton in Puerto Escondido) can separate the living area from the sleeping area. The private bathroom has a large bathtub, luxuriously designed in rich, green tiles. The suite has ceiling and floor fans, plus excellent ventilation from the screen windows and doors. AC with an extra charge. The apartment is fully furnished, including wifi, fully-equipped kitchen, private bath, hot water, a patio area, daily housekeeping except on Sundays, fans and A/C upon request (with an extra fee). Chlorine-free pool, wifi in the suite and throughout, a complimentary coffee bar in the mornings, yoga and water aerobics classes available and free private parking. A menu of additional services is available with massages, acupuncture, reflexology, reiki, pedicure/manicure, etc. Just 10 km from the Puerto Escondido airport and a one-minute walk from Zicatela beach, Casamar is a tranquil place set in closed, luscious gardens with high palm trees. Enjoy the cool pool, terraces with lounge chairs and garden hammocks. Stroll to the beach for a swim or a long walk. Casamar is a collection of uniquely designed apartments in an elegant garden setting. Each apartment is uniquely styled in the Mexican spirit, by local artists with traditional hand-crafted tile, hand-loomed cotton décor and artisan-created wooden objects. Also enjoy use of the bbq grill, a lounge area with satellite t.v., and a lending library. The area offers an array of activities from Spanish lessons to nature tours. We are happy to assist you in making arrangements. The center of Puerto Escondido and the market are a 5-minute taxi ride away. Casamar was designed as a place to come together with family and friends. Sharing the beautiful space to simply connect without the everyday distractions of life, to simply be together and appreciate each other and our stretch of coast. We fell in love with this off-the-beaten path paradise: a place where Old Mexico still delivers fresh handmade tortillas and where the sound of the surf will relax and reinvigorate you. We are located steps away from La Punta, a surfer's paradise and are close to numerous beaches. You can enjoy water sports of all kinds, sightseeing in the hills, festivals in the town, shopping for hand-made crafts, and more. Our beautiful villa features lush gardens, hand-laid Talavera tile, woodwork, original artwork, and hand woven bedspreads. There are many common areas for relaxing in the garden. Sit poolside with a drink, look out over the ocean from our terrace or join us for a yoga class. Hot water in bathroom. Hand-laid talavera tile. Air conditioning is available for an additional fee. Ceiling and floor fans are in the apartment and most people find they do not need AC. Contact us if you would like a grocery service for your arrival. The suite has a fully-equipped kitchen with full stove, oven and refrigerator. An American style kitchen, there is a bar/counter inside and a table on the terrace. Copper ionization system. No chlorine. Tasteless, odorless, no chlorine damage. We offer complimentary yoga and agua aerobics. Laundry service is available for an additional fee. I cannot say how much we enjoyed our stay at Casamar! The pictures do not do justice to the beauty of the little resort. The accommodations are great, the staff is attentive, positive, and work to fully satisfy any request. The overall feeling is serenity, community, and healthy choices! My wife and I enjoyed the yoga (thanks, Nora! ), the kitchen provides great meals, and the owners, Will and Rosalie, are helpful and caring! The Monday evening "meet and greet" events are a good way to build a sense of community. We have reserved a stay for next year, and look forward to our time in this wonderful resort. Casamar Suites: a special boutique hotel located in “La Punta” Puerto Escondido, Mexico. 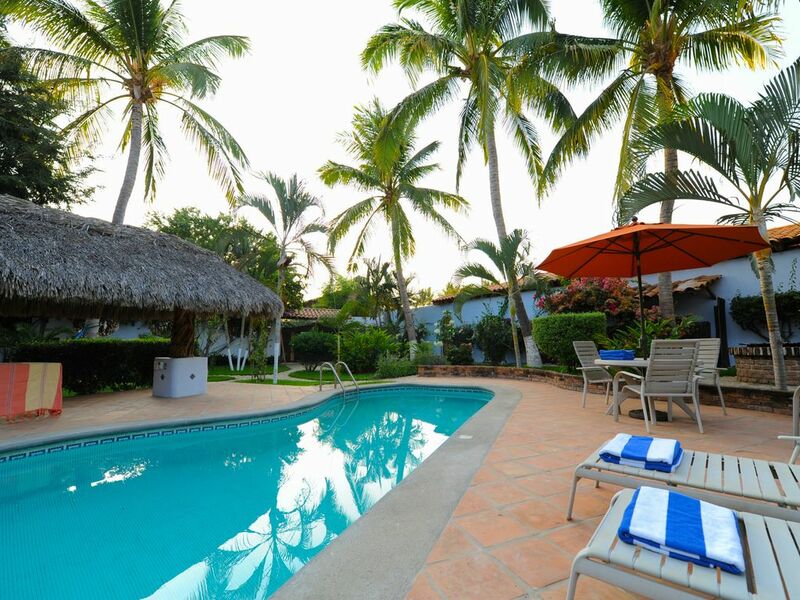 At Casamar, one can enjoy peaceful accommodation while being close to downtown Puerto Escondido. During a recent two month, solo vacation to Puerto Escondido this spring, I stayed at five different hotels. Having returned to Puerto Escondido for a second visit this year, Casamar Suites was easily the place and location that I chose to make home. •	Easily the very best mid range hotel in all of Puerto Escondido. •	Excellent year round surfing, swimming at La Punta - with a lifeguard tower. •	Staff/owners who understand what “service” really means. •	The manager lives on site, providing additional security & assistance whenever needed. •	All suites have fully equipped kitchens, private bathrooms & patios. Tasteful décor & authentic Mexican Talavera tile add to the charm & comfort of this wonderful hotel. •	Laundry service available, condiments for cooking, pool toys. Securing a reservation with your deposit means you accept the terms and conditions of our Cancellation Policy. Please visit our website for information about our Cancellation Policy. Air conditioning is available in all units with an extra charge of $10-$15/day. This fee is payable on arrival if you wish to use AC.